The Henry is pleased to present a focused exhibition of works by the celebrated British artist Sean Scully (born 1945). The presentation pairs the artist’s photographic Harris and Lewis Shacks portfolio, from the museum’s permanent collection, with October, a large scale oil painting from the same period, to examine and expose the rich dialogue between the two mediums in the artist’s oeuvre. Known primarily as a painter who continues to work in the heroic scale and tradition of earlier abstractionists, Scully has engaged photography since the late 1970s as a device to record the world around him with a particular emphasis on structure, texture, and form. 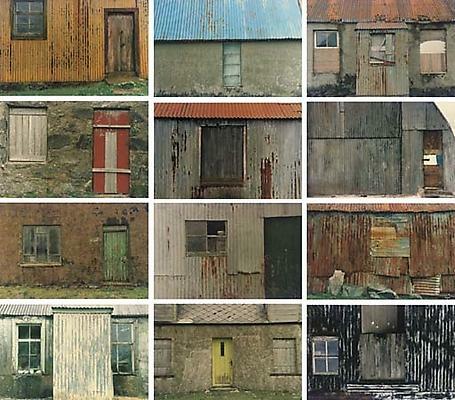 The Harris and Lewis Shacks portfolio, shot in the Outer Hebrides of Scotland, is a series of twelve close-ups of the worn and haphazardly constructed surfaces of dwellings on the islands of Harris and Lewis. The isolated architectural elements are tightly framed by the lens and captured in a deadpan manner that makes them appear like deliberately flattened fragments rather than full scale architectural structures. The exhibition aims to show that Scully’s photographs and paintings are autonomous works that are not directly interrelated, but still hold an intimate and organic bond, one that is forged in the interstitial space between reality and representation.